Power chairs and scooters each have their own advantages and disadvantages. Choosing the one that’s right for you is one of the most important decisions you will make. If you cannot self-propel, a power chair can allow you to get around easily and independently. Because a variety of options is available, a power chair can accommodate a range of mobility issues. 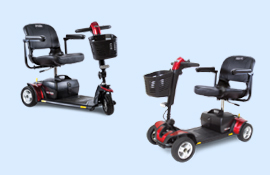 Travel power chairs are available, as are models with center-wheel drive, which offers a tight-turning radius. A power scooter is idea for someone who has mobility issues but doesn’t need a wheelchair. Many power scooters can be customized and assembled and disassembled easily for travel. Lift recliners can be used to recline your position or to extend your feet using a footrest.. If you need mobility assistance, contact the experts at Medequip. We offer a range of equipment and services and can answer all of your questions. Give us a call.